Savina Cavallo: When I'm 61....Oh That's Today!! When I'm 61....Oh That's Today!! I love this blog. I started it quite a few years ago and everything I have shared here has always come from my heart, my own experience and never trying to convince anyone or sell anything. So, I do the same today. 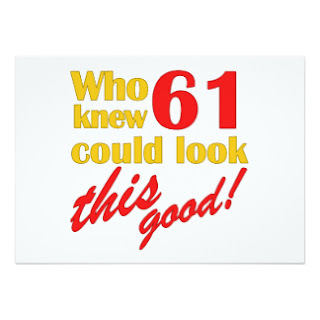 I feel I want to post where I'm at on this beautiful day, my 61st birthday. I'm at a really good place in my life. I am learning to be grateful and appreciative just because. Yes, I have so many blessings and so many "things" to be grateful for. But those things can be taken away or leave. So, gratitude for me is being joyful just because. I've learned this just recently. All my states of happiness in the past were attached to something or someone outside myself. How freeing it is for me to finally begin understanding and enjoying the realization that God/Love/Freedom/Heaven is inside of me and that this journey called Life is really about discovering that Truth. And then living it, moment to moment. It's a practice you know. It doesn't come naturally at first, since I've been programmed by everything including myself to believe otherwise. So, as I drive, or walk, or work, I choose to look at the trees, breathe in Nature, give the best of me to all that I am doing. And it feels really good. All that said, I am also so grateful for all that I have lived, all that I am, and all the wonderful people and experiences I have had in my life. I have these three wonderful beings that are my children. They are unique and strong and powerful and being their own expression of themselves. I honor the experience of having been born and raised in that wonderful, high-energy and incredible city that is New York. As they say, once a New Yorker, always a New Yorker. Then stepping into the ocean of a new culture such as the Dominican Republic, where I lived for 30 years and learned so much about life there. That was a real challenge. I've been blessed with really good friends, unique lovers, good and not so good bosses and workplaces. But all part of my journey. I became a life coach and even a minister in these later years. And am proud of it! I feel as if I am starting on a new journey now....an unknown one. I don't know what is coming, but I know it is really good. I am open, willing and grateful. Thank you God!! !